(Jan. 19, 1945) -- Seaman First-Class Thurston Fuller Woodford, son of C. Thurston Woodford of Verona, formerly of Nutley, was reported missing Nov. 10, 1944, after the explosion of the munitions ship, USS Mount Hood at its base in the South Pacific, on which he served. Seaman Woodford is included in the Navy’s official casualty list released today. His family received word from the Navy department on last Nov. 30 and it was confirmed after Christmas. The 19-year-old member of the U.S. naval reserve last sent a letter written on Nov. 4 saying that the ship was waiting to discharge its cargo. Woodford trained at Newport, R.I., and Norfolk, Va., going on active duty last Aug. 20. His service number is 08136738. His family last saw him in August when he was home on a five-day leave. He was graduated with honors from Montclair Academy last June, where he was editor of the yearbook, a member of the tennis team, Forum and Red and Black, an honorary society. 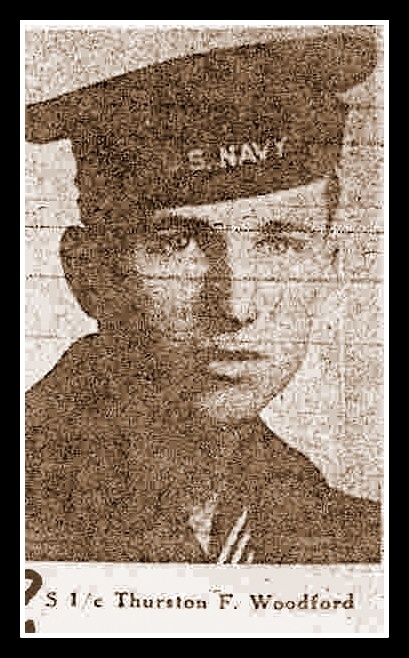 He has a brother William, M. a student at Cornell University, Ithaca, N.Y.
Woodford is listed on the tablets of the missing at Manila American Cemetery, Manila, Philippines.